The best way to attract hummingbirds to your yard or deck is to provide lots of large, colourful flowers, preferably wild native species, and one or more good hummingbird feeders. Hummingbirds have no sense of smell and find food by sight, so both flowers and feeders should be very visible. Hummingbirds’ favourite colour is red, so providing red flowers (preferably tubular or climbing flowers) and having a red feeder or a feeder decorated with artificial red flowers will increase the likelihood of enticing hummingbirds to visit. Hummingbird feeders can be purchased in many garden supply stores. The best feeders are at least partially bright red. 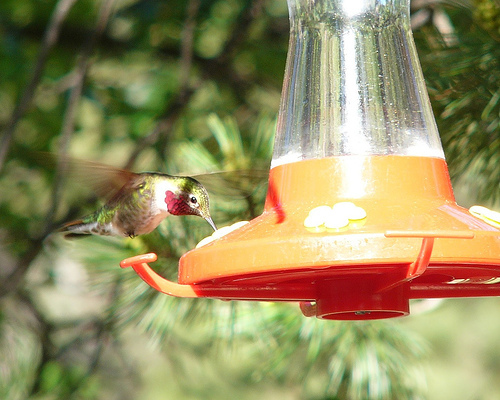 Never use food colouring, honey or artificial sweeteners in a hummingbird feeder. Consuming honey can cause a tongue fungus in hummingbirds, and artificial sweeteners lack nutritional value. Avoid instant nectars, which usually contain food colouring or other unhealthy ingredients (see the hummingbird nectar recipe above). To make your own hummingbird feeder, decorate a glass jar with bright red silk or plastic flowers. Flowers can be attached with waterproof red electrical tape, which is available at most hardware stores. Next, punch several holes in the lid by placing the lid on a piece of wood and hammering a large nail through it in several spots. Fill the jar with nectar, screw the lid on tightly, and hang the jar upright in an open area using twine or wire. Clean the feeder with hot water and a mild detergent, and rinse very thoroughly with hot water before refilling. The feeder should be cleaned and the nectar replaced at least once a week, and preferably every three days to prevent bacteria build-up. To view photos of plants that attract butterflies, see the Butterfly Plants Gallery. For more gardening articles, visit the main Gardening page. To make hummingbird nectar, mix 4 parts water with 1 part organic cane sugar and boil for a few minutes until the sugar dissolves. Cool the nectar thoroughly before adding it to the feeder. Large batches can be made and stored in the fridge for 3-4 weeks. This nectar recipe can also be used for butterfly feeders (though butterflies require a different type of feeder). Canadian Wildlife Federation. (2007). “Hummingbirds.” Wildaboutgardening.org. Hilton Pond Center for Piedmont Natural History & Operation Ruby Throat: The Hummingbird Project. (n.d.). “Other Hummingbird Species.” Rubythroat.org.